The global digital therapeutic devices market is divided among a large number of players that features stiff competition, notes a fresh market study by Transparency Market Research (TMR). Going ahead, the competitive scenario is likely to intensify as more and more medical device companies make a foray into this market with their technological expertise. However, some of the companies hold a strong foothold than the rest in the global digital therapeutics devices market, namely Proteus Digital Health, WellDoc Inc., Noom Inc., Propeller Health, Canary Health, BiogeniQ Inc., Glooko Inc., Claritas MindSciences, Nanobiosys Inc., Jintronix Inc., Zest Health LLC, HealthMine Inc., BioTelemetry Inc., Digital Therapeutics, Omada Health Inc., Livongo Health, Ginger.io, Inc., 2Morrow Inc., Mango Health, Twine Health Inc., Firstbeat Technologies Ltd, Big Health, Dthera Sciences, Virta Health Corp, Meru Health Inc., Pear Therapeutics Inc., and Blue Mesa. As per estimates presented by a TMR report, the demand in the global digital therapeutic devices market will expand at an impressive 15.6% CAGR during the forecast period between 2017 and 2025. The market for digital therapeutic devices is estimated to touch a revenue valuation of US$2,082.3 mn by 2025-end, substantially up from its evaluated worth of US$590.8 mn in 2016. Amongst the key product segments, insulin pumps held the leading market share in 2016 due to increasing prevalence of diabetes. Geography-wise, North America dominated the global digital therapeutic devices market in 2016. The growth of the digital therapeutic devices market is primarily driven by increasing use of technology for therapeutics of medical conditions. The presence of savvy consumers who are aware of the availability of technologically advanced products for treating a medical condition coupled with rising disposable income that enables them to opt for these products is favoring the digital therapeutic devices market. Moreover, several governments are also taking initiatives for the adoption of digital therapeutic devices that marks a significant change from traditional healthcare practices. For example, in July 2016, Japan’s Ministry of Economy, Trade, and Industry announced plans to start a demonstration project to improve diabetes management through IoT and digitization of health information. The increasing prevalence of chronic diseases is positively influencing the digital therapeutic devices market. According to Partnership to Fight Chronic Disease (PFCD), chronic diseases are the leading cause of death and disability in the U.S, and account for over 1.7 million deaths each year. 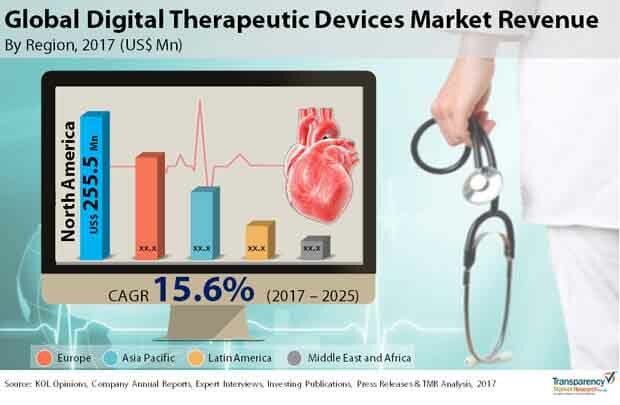 Further, rising incidence of diabetes and cardiovascular diseases are some other factors likely to drive the growth of digital therapeutic devices market in the forecast period. As per statistics of the World Health Organization, in 2015, diabetes was related to 1.6 million deaths globally. Another 2.2 million deaths were related to high blood glucose in 2012. However, factors such as data security breach and the high cost of digital therapeutic devices are some of the key challenges restraining the growth of the digital therapeutic devices market.